How to make fruit smoothies delicious! You will quickly learn how to make fruit smoothies in your home. You will surprise yourself at your gourmet smoothie capabilities! As you play with your smoothie recipes, you will learn how much liquid is the perfect amount by just dumping and pouring. Using water as the liquid is a great way to learn how to make fruit smoothies into low calorie smoothie recipes. It doesn't add any calories. Pure water is my main liquid used in all of my low fat smoothies. One thing that you need to keep in mind is... Make sure that you do not add too much water. That will only “water” down the smoothie and make it bland! It is better to use less and add more if needed, than to add too much and regret the results. Many smoothie recipes that I have seen call for juice. Most of the time, juice bought at the store really isn’t juice at all. Some are only 5 percent juice. The best juice is the stuff straight from the fruit itself. Just using a couple of peeled juicy oranges with some water will do the trick. Or you can extract it with a juicer. A juicer will separate the pulp from the juice. You can even juice carrots, beets, and pineapple cores. But that does require extra time on your hands. But the time invested is well worth the health benefits of juicing. 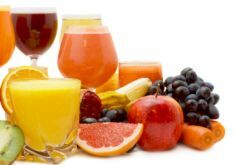 If you cannot get a fresh juice, make sure that you buy 100% juice. If I have guests over and I want to make a sweeter than normal smoothie, I add half juice and half pure water. That creates a heavenly sweet smoothie. Yummmm! This trick also works great for kids who are used to extremely sweet drinks. Pretty much any kind of 100 percent juice works. Orange, apple, blueberry, grape, and pineapple. But do take caution... They are high in natural sugars. Someone with diabetes needs to watch their blood sugars with any kind of drink with sugar, natural or refined. There are so many smoothie recipes using milk as a liquid. I am not going to preach at you. I just want you to know that there are better alternatives to cow’s milk that work great in your smoothies. If you want an alternative... Try nut milks. They taste wonderful! Personally, I do not purchase pre-made almond milk or rice milk. I have found that I just throw in a handful of nuts with water with the rest of the ingredients. You have homemade nut milk already blended up with your smoothie. You don’t have to strain it. This saves you time! Plus, you receive tons of beneficial nutrients and fiber. Saves your digestive system! Since you do not have to buy the expensive pre-made milks, you save your money! Coconut milk also blends into a delicious smoothie! Coconut oil has been highly scrutinized in the mainstream media. Through studies, it is proving itself to be a health promoting fat to include in your diet. Several medical specialists have even said that the fat in coconuts actually cause people to lose weight! I’m all for that! One thing to know is to not overdose. Even though the fat is “healthy”, there are two reasons why you don’t want to use 1-2 cups of coconut milk in your smoothie. One, that is just too much fat! Two, the flavor would be too intense. I usually use 1/4 to 1/2 cup coconut milk mixed with 1-2 cups of pure water. You can make your own low fat smoothies! Just keep experimenting with healthy ingredients. Surprise yourself and your friends with delicious fruit smoothies.